Alarms and alerts have become a necessity in our ever changing lives. House alarms, car alarms, key finder alerts, “hey you left the refrigerator” reminders, “someone let the cat out” alert. Face it, alarms and alerts provide peace of mind and protect us and our loved ones. 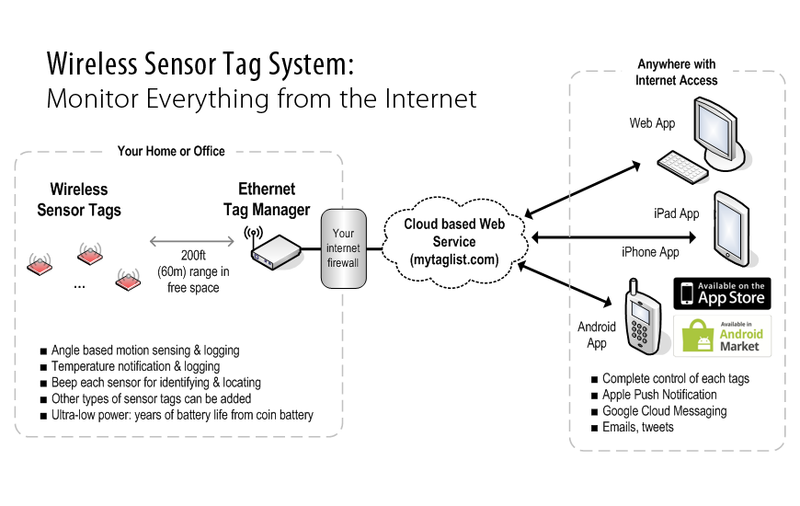 Wireless Sensor Tags developed by Cao Gadgets LLC, would like to help in this process. Wireless Sensor Tags are tiny, battery powered devices that detect changes in temperature, location or angle. Connect the Tag Manager to power and your router and it will locate up to 255 sensors within 200 feet. Then the fun begins. Download the app for your smart device (iOS or Android) and you will receive continuous updates – via email, tweet or smart device – of temperature changes or movement in the sensors. Also, they detect changes in angle. All of this enables you to monitor just about anything from anywhere in the world! Temperature of the refrigerator, whether the garage door is up or down, whether the dog is in or out. Name it! Another perk is the lost item finder. Activate the feature on the app and the sensor will beep constantly until moved. So attach one to your keys…or your mind before you lose it! And you set the frequency or type of alert you receive. So you can always know if your front door is open but don’t have to get notices worry if the cat sneaks out. Personally this is one of the coolest things I have reviewed in recent memory. The uses are really limitless. And for the minor investment – just $69 for the Ethernet Tag Manager and $15 per Wireless Sensor it is somewhat of a no brainer to protect your valuables. Fortunately or unfortunately the demand has outpaced supply. But production is in full swing and you an expect September ship dates. So think about what is important in your life. And consider the benefits of always knowing what happens when you are away.